As expected Manager Ivan Golac stuck to the same eleven which faced Dundee for the first of a league and cup double against Motherwell. The visitors were first to threaten with a well struck volley from Tommy Coyne sneaking past the post after three minutes. Tommy McLean's men had the better of the very early stages, but United soon got into their rhythm and skipper Maurice Malpas sent in a couple of shots off target before swinging over a right footed cross from the left from which Craig Brewster buried a header past Dykstra from the edge of the six yard box. The Motherwell keeper then became their hero as he pulled off a series of tremendous saves whilst at the other end United proceeded to shoot themselves in the foot by conceding not one, but two own goals! Before those calamities, Dykstra had already twice denied United a second. First he could only fend away Craig Brewster's vicious volley and Jim Mclnally picked up the rebound, but Dykstra foiled him as he tried to round the keeper. Seven minutes from the interval came the first of the two own goals. 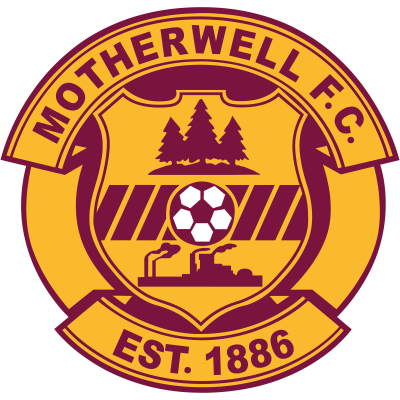 Motherwell did have the United defence under some pressure, but when McKinnon headed back across the face of the goal, there appeared to be enough tangerine jerseys to cope until Dave Bowman ran back and headed into his own net at the near post. United's response was to twice carve open the Motherwell defence within minutes. First Billy McKinlay found himself clear, but Dykstra parried his shot and the blocked at close quarters Craig Brewster's follow up effort. Very shortly afterwards Brian Welsh was advancing on Dykstra as again the Well defence was ripped open, but once more Motherwell's Dutch keeper proved too big a barrier to pass as he successfully denied the United defender. It was all the more ironic, therefore, when Dolan's innocent looking cross turned into something much more menacing thanks to a double dutch blunder. Freddy van der Hoorn headed the ball back to find his fellow countryman Guide van de Kamp in goal only to find he had already left his charge to collect the cross and the ball ran over the line with Jim Mclnally in hot, but unsuccessful pursuit! As someone joked at half-time the last time United had scored three goals in the first half was against Rangers at Ibrox! But there was to be no happy ending here as United tried manfully to break down Motherwell's well organised defence. Again when they did create an opening in the second half, Dykstra was still an immovable object Scott Crabbe and Paddy Connolly created the chance for Maurice Malpas, but the Dutch keeper spread himself to save. Christian Dailly and Jerren Nixon replaced the own goal miscreants and the latter forced a save out of Dykstra at the near post as he turned the ball round for a corner. 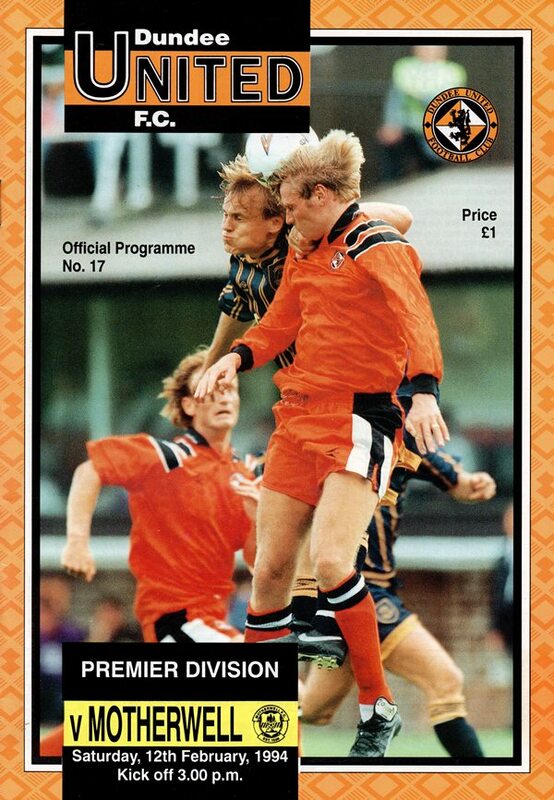 When that kick came over, Craig Brewster deftly stretched to steer a shot on target and a goal was only prevented by the combined efforts of Rab Shannon and that man Dykstra. So after 18 years Motherwell finally recorded a victory at Tannadice, but they could scarcely have envisaged it being handed to them on a plate as it was here! This afternoon we have the first of a double header with Motherwell which will have a vital bearing on the success or otherwise of both club's seasons. We go into the league encounter undefeated this year and that is the way I hope we can continue. There is no doubt the lads have done well, but I am not complacent and we must strive to improve upon the recent run in which there have been too many draws. On one hand, I want us to be the hardest team in the league to beat which with only 2 defeats in the last twelve outings we are well on the say to becoming, but we must look for more back to back victories which would come in more than useful over the next couple of matches! Last week's derby match was typical of what has been happening of late. We dominated most of the game, played good football, created enough chances, but lack of penetration and a second goal to kill the match off meant, in the end, we only had ourselves to blame for dropping a point. I hope we can remedy this quickly, because in other facets of the game we played as I want the team to do, running from'deep with every player knowing exactly what his duties are in each area. Winning is no less than our tremendous fans deserve, because at a time when most clubs are suffering at the turnstiles, our support is holding up well and has shown an increase in recent weeks. With their help, I am confident that we can do well in the two crucial games which lie ahead and achieve our goal of edging closer to the top of the table and reach the quarter finals of the Scottish Cup. It will, however, be far from easy against one of the most consistent teams in the league this season. I admire Tommy McLean for what he has achieved and it is always a pleasure to welcome his fine footballing side which includes former United defender Miodrag Krivokapic who has done magnificently for them this season. The forthcoming Scottish Cup tie must be put on the back-burner this afternoon, because for now all our thoughts must be concentrated on beating Motherwell for the first time this season.